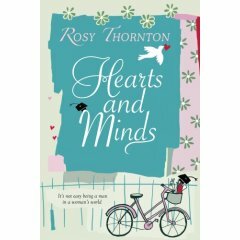 It seems about right to be writing about Rosy Thornton’s campus novel Hearts and Minds on a day my students have given me a headache. Yes, the end of the semester is terrible, as usual. It’s too bad I’ve already finished this novel, because reading it would provide some comfort after a long day, whereas the book I’ve just begun, Against Happiness, will not. But maybe it will make me feel better to write about somebody else’s problems with faculty politics and student drama rather than dwelling on my own. Hearts and Minds is a thoroughly entertaining novel. It takes place at Cambridge, specifically at an all-women’s college, St. Radegund’s, which has recently hired a male Head of House, to the consternation of many of the faculty. James Rycarte is his name, and although he’s an able administrator and knows how to deal with difficult people, he finds himself with some formidable opponents, especially faculty member Ros Clarke, who is determined to undermine his leadership and see him gone. The other main character is Martha Pearce, an Economics faculty member and Senior Tutor, an administrative post that is due to end at the close of the year, leaving Martha without a job. Because of the demands of the Senior Tutor position, she has neglected her research, which will make it difficult to find another post. In addition to this looming problem, her husband has been more and more distanced of late and her daughter is showing signs of serious depression. She is left to manage this all on her own. The plot thickens when a potential donor appears, a friend of Rycarte’s, whose money could save the library, which is sinking into the mud at an alarming rate. This friend appears to be the college’s savior, until he declares that his daughter will be applying for admission and implies that he expects the donation and his daughter’s acceptance to go hand in hand. Here is an issue that could potentially divide the faculty and give Ros Clarke the ammunition she needs to force Rycarte out. I enjoyed the story and liked spending time with the characters, but another of the novel’s pleasures is reading about the college itself, with its traditions and oddities. Very near the beginning of the novel Rycarte arrives on campus for the first time since his interview, and so readers can learn about the college at the same time he does, watching him figure out details like the powers of the Head Porter and the lack of copy machines, and can follow along with him as he figures out who’s who amongst the faculty. It’s a good introduction to a place that in a lot of ways sounds charming — nearly everyone travels around on bicycles, which sounds wonderful — but which has its share of troubles, not least of which is a severe shortage of funds. The signs of financial hardship are everywhere, from the decision to stop offering the college’s residents breakfast to the existence of research fellowships that offer no stipend whatsoever. The college has been limping along for quite some time now, and Rycarte hopes the potential donation will turn things around, but he is unsure at what cost. One aspect of the book bothered me — Martha Pearce’s relationship with her husband was hard to take. Martha is an extremely hard-working, extremely dedicated person, one who cares deeply about the college and is willing to do whatever it takes to serve the school and to keep her family going. Her husband, though, spends his days lounging around, napping, and claiming to be working on his poetry. He offers her very little support, most distressingly when their daughter is obviously suffering. There were moments in the novel when I wanted Martha to walk out on him immediately and not look back. Martha’s self-sacrifices happen in real life quite often I’m sure, so it’s not a failure of realism, but still I couldn’t help but get annoyed at this character that readers are clearly meant to sympathize with. But this issue aside, I read the novel with great enjoyment; it’s a good book for when you want something that’s both smart and plot-driven, and I think lots of people would enjoy it, even those who haven’t set foot on a campus for decades. This sounds good and it must be a lot of fun. What is it about that Brit academic atmosphere that is so compelling and intoxicating? I haven’t read an academic novel for a long time and I’m way overdue. Thanks for the lovely review, Dorothy. Quite a few readers, it must be said, have shared your frustration with Martha’s martyred tendencies. My partner’s verdict was that she was a singularly joyless female, and he could quite see how she had driven her daughter to depression and her husband to the bottle! I’ve heard so many good things about this book, and this makes me want to read it even more. Funnily, my library had issues with the bottom floor sinking in places. Part of our renovation entailed having the entire first floor concrete dug up and repoured! This sounds like a good summer book (or maybe right before the fall semester begins), so I’ll have something good to look forward to. Is your semester over now? Our students finish today and graduation is tomorrow–the campus should be emptying out now! I liked all the cycling around too. And you are right, learning about the college as Rycarte does is loads of fun, the tree and the birds messing on his car, his bike getting locked for not having a permit, and then his rooms in all their floral glory. Hope your semester is done soon without too many more headaches! This one’s already on my list, but you’re making me feel I’d better race out and get it immediately. And how cool that Rosie Thornton actually commented. Zhiv — oh, I agree that British academic novels are wonderful, and I highly recommend this one — I never let much time pass before I pick up another example of the genre! Litlove — I’m used to riding around in crowds, but I suspect that Cambridge would make me want to get off the bike and walk! I’m glad to know it’s all authentically described — that makes the book even more enjoyable. Danielle — the semester is not quite over; the last day of classes is Monday, and then a week of finals. It’s not coming a moment too soon, let me tell you. How strange that your library is sinking too! Ann — interesting to know that about the ending; I thought it was a bit surprising — too bad things couldn’t end that way in real life more often. TJ — you’re right that the end is near; already I’m feeling the tension lift a little bit. Thanks for your encouragement! Stefanie — aren’t all those details great? The headache is now mercifully gone, and I’m hoping it’s not coming back! Emily — yes, it’s great to get a comment from a real live author! I hope you enjoy the book as much as I did. I’m just about to dive into “Hearts and Minds” and I’m anticipating it even more eagerly now that I’ve read your comments. I felt that it was best to wait until my term was over to read it, lest the characters’ academic stresses too closely echoed my own. With my grades safely in and no more teaching until September, now I’m ready to properly enjoy it! Dorothy this is a wonderful review. I had such a good time reading the book and it certainly made me wonder what it would be like to go to a school similar to St. Rad. I went to a huge school so this was quite different for me. I need to get Rosy’s other book!